In the fall 2012 the U.S. Institute of Peace and the Institute of International Education made its first Public Education for Peacebuilding Support awards to colleges, universities and public libraries around the U.S. In that first group, a number of community colleges including Shoreline Community College (SCC) in Shoreline, WA received awards. 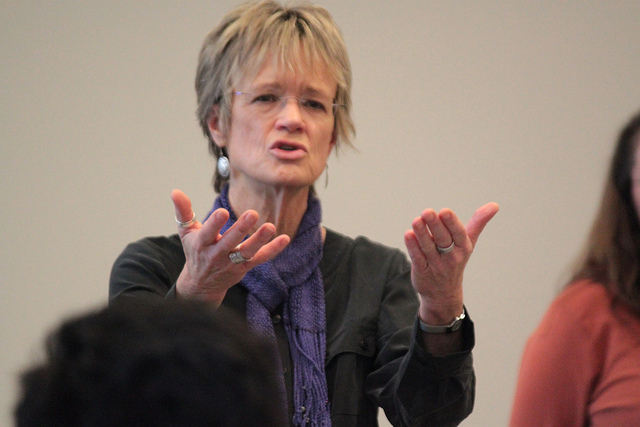 Faculty member Sarah Zale received funding for the “I Want to Understand You” workshop. The event was designed to focus on communication skill development and human rights awareness and took place on May 18, 2013 at the college. More than 50 students and community members attended. The event featured journalist and author Ethan Casey who writes about life in Haiti, Pakistan and other regions of the world where human rights are in focus. In addition, five University of Washington Evans School Humphrey Fellows from Haiti, Nepal, Pakistan, Rwanda, and Sri Lanka participated. Sarah Zale is a co-author of the chapter “Listening as the Foundation of Peacebuilding: Teaching Peace in the Humanities” included in Peacebuilding in Community Colleges: A Teaching Resource, recently published by USIP Press and edited by David J. Smith. The workshop featured interactive skits that demonstrated Augusto Boal’s Theatre of the Oppressed approach. The activities where informed by the work of the Compassionate Listening Project. The day was cosponsored by SCC’s Listening Tree Project and Global Affairs Center.